SOUTH Fremantle has built some form again and will want to continue that heading towards the finals but for Perth they simply need to win to remain a hope of ending that finals drought that stretches back to 1997. Prior to the clash at Lathlain Park in Round 10 this year, South Fremantle had dominated recent contests with Perth having won eight games in succession by an average of 52.1 points. The Bulldogs looked like making it nine straight as well leading by 20 points early in the last quarter before the Demons hit back with the game's last four goals for a stunning six-point win to give them genuine belief that they belonged in the finals race in 2018. Three weeks ago South Fremantle had slipped to third position and had suffered disappointing losses to Subiaco and Peel Thunder heading into the Round 17 bye. But the Bulldogs have responded since beating West Perth by five points and Swan Districts by 30 to be solid in second spot at 11-5. Even though South Fremantle's forward-line hasn’t quite come together still following the departure of Blaine Johnson and with Ben Saunders still to return, but it's a strong and stable line-up further up the field. With Brock Higgins carrying the ruck, South Fremantle's midfield is in good touch led by Shane Hockey, Nick Suban, Ryan Cook, Haiden Schloithe and Jacob Dragovich. The back-line is then working well led by key defenders Noah Strom, Chad Pearson and Blayne Wilson alongside Steven Edwards, Jason Maskos and Kyle Russell. Perth has now lost its past two matches to East Perth and Claremont to slip out of the top five with both the Royals and Tigers leapfrogging them. That leaves the Demons in an unenviable position of needing to beat at least one of the top two teams in the competition, South Fremantle and Subiaco, away from home in the final two rounds if they hope to end their finals drought that extends back to 1997. South Fremantle has got back to some good form over the past two weeks following the Round 17 bye with solid wins over West Perth and Swan Districts as they get closer to settling on their best 22 ahead of the finals as well. 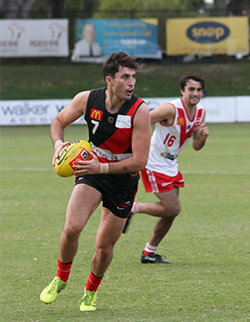 Triple Bernie Naylor Medallist Ben Saunders will spend another week in the reserves after returning last week from a hamstring injury and kicking three goals but captain Dylan Main will be back after missing the wins against the Falcons and Swans. Matthew Parker will also return from a one-week suspension for the Bulldogs with Jarrod Parry a chance to come in for his first appearance at league level since suffering an ankle injury early in the Round 3 game against West Perth at Joondalup Arena. Perth is in a position where it has to win on Saturday to keep its finals dream alive and as a result they have several options to strengthen the forward-line in an attempt to kick a winning score. Cody Ninyette comes straight back in from suspension while Lachlan Dennis could return as well having missed the last four games but he did kick a career-best five goals in the Demons' win over South Fremantle back in Round 10. Lennon Marlin is a chance to come in for Perth too for what would be his first league appearance of 2018 on the back of a seven-goal haul in the reserves last week against Claremont. Ben Giobbi and Kasey Nicholas are the other Perth players in the mix at the selection table while Kristian Cary is out injured and Marshall Jones hasn’t been able to hold his place in the side.